I had the great opportunity to meet our Mayor, George Ferguson, and lead him on a tour of Stoke Park Estate – well, I jumped at the chance, of course. 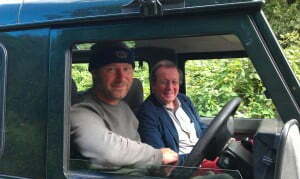 The Mayor arrived at Duchess gates on Saturday and we shook hands and I welcomed him to Stoke Park. As we drove around the estate for a while, so I could show the Mayor the entire 250 acre estate, we discussed the history of the park. The Mayor was very keen to take lots of pictures of the scenery as it was a glorious day and the sun was shining too; we visited the camp site within one of the woods which was constructed by young people from the community. It’s a place where local groups come to do various activities and he was incredibly impressed by the work that volunteers and young people have committed to the park over the years. We then sat down and I shared my lifetime of experiences of being at Stoke Park with the Mayor; he was very interested with the architecture of the Dower House. We had a walk through one of the historical woods and I explained all about the pre historic past of Stoke Park which fascinated him. 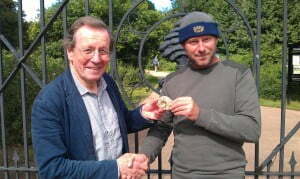 Steve presents the Mayor with a fossilised ammonite from his own collection. 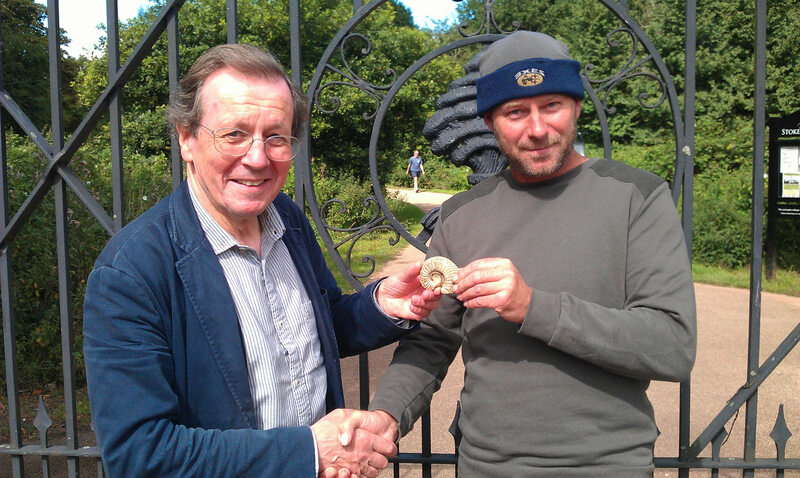 As we ended our meeting, I presented the mayor with a rare ammonite fossil taken from my collection and he was delighted with it. The Mayor was very keen to stop and talk to a family who were blackberry picking too, it was interesting to look at people’s faces as we drove past them, as no one would expect to see the Mayor of Bristol in Stoke Park.